Construction has been underway at our North Vancouver G3 Terminal Vancouver site at Lynnterm West Gate since March 7, 2017, after we successfully completed an extensive project and environmental review and permitting process with the Vancouver Fraser Port Authority. Peter Kiewit Sons ULC has been selected as our design-build construction contractor for the project. They have extensive experience and success building large scale projects in British Columbia, including the Port Mann Bridge and the Sea to Sky Highway. G3 has received an extension to the night shift work exemption on its Project and Environmental Review Permit #15-180 from the Vancouver Fraser Port Authority for the period from May 1st, 2019 to October 31st, 2019. The exemption allows work to take place between the hours of 8:00 p.m. and 7:00 a.m., up to seven (7) days a week for a variety of reasons which include the need to coordinate construction activities safely around co-joining and adjacent overhead work, and where preparation or servicing is required for safe construction operations. It also allows work that must be coordinated around equipment availability and the requirements of neighbouring port tenants. Construction activity will be limited to operations that are anticipated to have low noise and light impacts to the surrounding community. 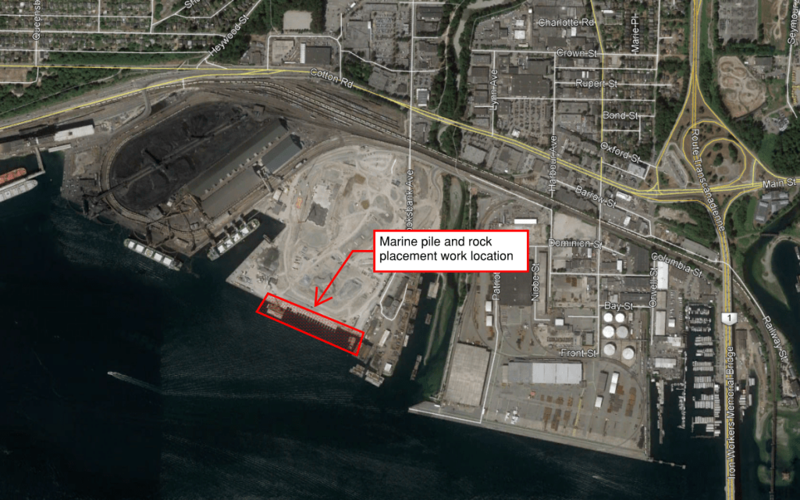 G3 is complying with Vancouver Fraser Port Authority requirements for these extended work hours by implementing mitigation measures and providing further advanced notice when required. Noise levels during this period will be monitored to verify that construction activities do not result in a notable increase to the average existing noise levels. Additionally, lighting mitigation will be in place including lights being placed as close to the ground as possible and directed down and away from residential areas. Permanent lighting, which is designed to have a low impact on the surrounding community, is displacing the higher intensity construction lighting where possible and as safe working conditions allow. Overall construction activities will continue for the next year, but later in 2019 they will begin to ramp down as portions of the facility near completion. At that time, testing of individual systems by the construction contractor will begin and noise and light levels will generally reflect operational parameters expected when G3 assumes the site from the construction contractor in the spring of 2020. During the testing phase, the construction contractor will start and verify equipment functionality and concurrently transition to permanent low impact lighting which will replace the temporary construction lighting. Rail systems will be tested in the fall of this year and ship loading systems will be tested in late 2019 / early 2020. Only when system-wide tests are successful will the facility be turned over to G3 for commercial operations in the spring of 2020. Further to our Community Update of March 4, 2019, we can now advise the specific dates when the facility’s ship loaders will be installed. The installation will take place on the marine side of the site, utilizing the marine heavy lift barge, between approximately April 5 and April 30, 2019. The work is being done in accordance with existing permits and exemptions from the Vancouver Fraser Port Authority (VFPA). Due to safety and marine conditions it may be necessary to work outside normal work hours, but this should be limited to less than 15% of the total work hours. The work will take place at the shoreline and utilize structural steel erection mitigation, so noticeable noise or light impacts are not expected. G3 does not expect the additional activities to generate noticeable noise or light impacts to the adjacent community. Issued: July 27, 2018 – Construction Amendment Notice of intermittent night shift work at G3 Terminal Vancouver until October 31. In April 2018, G3 received an amendment to their existing permit from the Vancouver Fraser Port Authority to conduct night shift work between May 1 and October 31, 2018 at the G3 Terminal Vancouver site. A construction notice was sent in April to inform the community of these works. G3 has now received a separate amendment to conduct additional night shift work between the hours of 8:00 p.m. and 7:00 a.m. from now to Wednesday, October 31, 2018. Under this recent amendment, G3 will increase the frequency of activities occurring between 8:00 p.m. and 7:00 a.m., and will be working at additional locations on the site. Generally, this night shift work will occur Monday through Saturday from 8:00 p.m. until 2:00 a.m. on site for a variety of reasons, including the need to coordinate work around tide cycles, the requirements of neighbouring tenants, where required for safe construction operations, to reduce construction congestion to improve safety and efficiency, and to address environmental conditions. Rock placement, placed via GPS positioned clam bucket and slowly lowered onto the seabed. Please refer to G3’s construction notice issued February 15, 2018 for more details. Working inside new concrete buildings (installing rebar, pouring concrete, and steel and equipment installation). Pouring concrete on silo roofs to meet design requirements for maximum concrete placing temperatures. If any operations are anticipated to have a significant impact outside the project site, we will issue a separate construction notice. G3 is complying with the port authority’s requirements for these extended work hours by implementing mitigation measures and providing additional notice to the community. Noise levels during this period will be monitored to verify that construction activities do not result in a noticeable increase to the average existing noise levels. Using black screens when conducting welding work. Utilization of synthetic hammers in lieu of steel hammers, to minimize noise when assembling and erecting structural steel. G3 has received an approved permit amendment to conduct intermittent night shift work between the hours of 8:00pm and 7:00am at the G3 Terminal Vancouver site from Tuesday, May 1, 2018 to Wednesday, October 31, 2018. G3 will undertake intermittent night shift work on site for a variety of reasons which include the need to coordinate work around tide cycles, the requirements of neighbouring tenants, and where preparation or servicing is required for safe construction operations. G3 is complying with Vancouver Fraser Port Authority requirements for these extended work hours by implementing mitigation measures and providing further advanced notice as required. Noise levels during this period will be monitored to verify that construction activities do not result in a notable increase to the average existing noise levels. 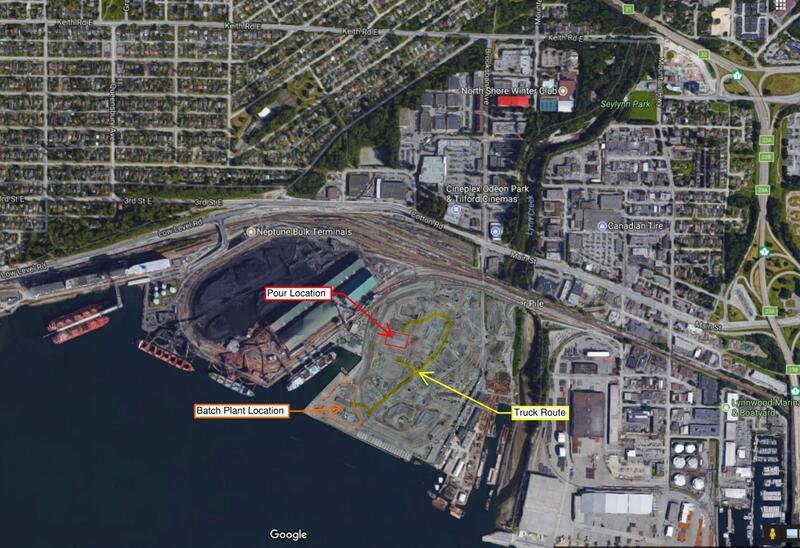 Please find a construction notification for anticipated night shift work beginning on Wednesday, April 4, 2018 and continuing until Saturday, April 14, 2018 (between the hours of 8 p.m. and 7 a.m.) to construct the final 16 of 48 grain storage silos at the G3 Terminal Vancouver site. The continuous concrete pour will take place over an 11-day period. Night shift work is required as the concrete must be poured continually to ensure structural design integrity of the silos which will reach a height of approximately 42.6 metres (140 ft.). Lights will be directed down and away from residential areas. While this is the case, please note for safety reasons the lighting is expected to be more visible than previous night time concrete pour work because the working area increases in height as the grain storage silos are built. Please find a construction notification for anticipated night shift work beginning on Tuesday, March 6, 2018 and continuing until Tuesday, March 23, 2018 (between the hours of 8 p.m. and 7 a.m.) to construct the Cleaning Building at the G3 Terminal Vancouver site. The continuous concrete pour will take place over an 18-day period. Night shift work is required as the concrete must be poured continually to ensure structural design integrity of the building which will reach a height of approximately 68 metres (223 ft.). Lights will be directed down and away from residential areas. While this is the case, please note for safety reasons the lighting is expected to be more visible than previous night time concrete pour work because the working area increases in height as the building is built. G3 Terminal Vancouver’s construction team will continue pile installation from Thursday, March 1, 2018 until Friday, November 30, 2018 during the regular work hours of 7 a.m. to 8 p.m. (Monday to Saturday). Where construction practices allow, the vibratory piling installation method will be used, which produces less noise than the full use of impact installation methods. For non-temporary piles, the impact piling installation method is necessary for the final stages of pile installation to develop the required bearing capacities. Piles are needed to support foundations of the marine dock and ship loading equipment that will facilitate the movement of grain products from the incoming trains onto ships for export. Rock placement is required to support loads created by the new rail line and has been proceeding since August 19, 2017, with rock delivery to site via barge. This work will continue from Thursday, March 1, 2018 to Monday, April 30, 2018. Placement of rock proceeds in three layers: revetment fill (i.e., smaller rock), and then two layers of larger surface armour rock. The armour rock also creates new habitat for fish. Rock will be placed with a GPS positioned clam bucket, slowly lowered onto the seabed and opened once target depth is reached. A silt curtain, suspended 3m depth from surface, will be utilized to prevent fish from entering any active rock placement areas. The aforementioned works are authorized under an amendment dated February 7, 2018 to the project permit from the Vancouver Fraser Port Authority. To protect the marine environment during this work, we will use biodegradable hydraulic fluid in marine machinery, employ a bubble curtain during impact pile installation to reduce underwater sound levels, and will monitor for any marine mammal activity. As noise is expected with pile installation, we will be actively monitoring noise levels during the aforementioned activities to ensure that the sound they produce remains within predicted levels. Additional mitigation measures, during the fisheries sensitive period which is from March 1, 2018 to August 15, 2018, include monitoring in-water piling installation and removal by appropriately qualified environmental professionals on a full-time basis. Should juvenile salmon or other fish be noted within the immediate project vicinity, special precautions will be taken to ensure that fish are not harmed – including halting any in-water works. The decision to halt work will be at the direction of the qualified environmental professional. Additionally, rock placement shall not occur from May 1, 2018 to August 15, 2018. Please find a construction notification for anticipated night shift work beginning on Tuesday, January 30, 2018 and continuing until Friday, February 9, 2018 (between the hours of 8 p.m. and 7 a.m.) to construct the Scale Tower at the G3 Terminal Vancouver site. The continuous concrete pour will take place over an eight to 10 day period. Night shift work is required as the concrete must be poured continually to ensure structural integrity of the building which will reach a height of approximately 48.8 metres (160 ft.). Lights will be directed down and away from residential areas. While this is the case, please note for safety reasons the lighting is expected to be more visible than previous night time concrete pour work because the working area increases in height as the scale tower is built. Please find a construction notification for day and night shift work on Sunday, December 3, 2017 to complete slip assembly work required for an upcoming concrete pour. This work is not expected to have any significant impacts to the surrounding community. Please also find a construction notification for anticipated night shift work beginning on Friday, December 8, 2017 and continuing until Monday, December 18, 2017 (between the hours of 8 p.m. and 7 a.m.) to construct the second 16 of 48 grain storage silos at the G3 Terminal Vancouver site. The continuous concrete pour will take place over an eight to 10 day period. Night shift work is required as the concrete must be poured continually to ensure structural design integrity of the silos which will reach a height of approximately 42.6 metres (140 ft.). Please find a construction notification for anticipated night shift work beginning on November 15, 2017, and continuing until November 26, 2017, between the hours of 8 p.m. and 7 a.m.
During the timeframe noted above, G3 will undertake an additional period of night-shift activity related to concrete pours to construct the first 16 of 48 grain storage silos at the G3 Terminal Vancouver site. The continuous concrete pour will take place over an eight to 10 day period. Night shift work is required as the concrete must be poured continually to ensure structural design integrity of the silos which will reach a height of approximately 42.6 metres (140 ft.). Please find a construction notification for anticipated intermittent night shift work beginning on October 11, 2017, and continuing until October 14, 2017, between the hours of 8 p.m. and 7 a.m.
During the timeframe noted above, G3 will undertake an additional period of night-shift activity related to concrete pours to construct the foundations of the grain silos at the G3 Terminal Vancouver site that will take place over a 30-hour period. Night shift work is required as the concrete must be poured continually to ensure structural design integrity of the foundations. Lights will be placed as close to the ground and possible and be directed down and away from residential areas. This construction notification is for anticipated intermittent night shift work beginning on September 4, 2017, and continuing until September 11, 2017, between the hours of 8 p.m. and 7 a.m.
During the timeframe noted above, G3 will undertake an additional period of night-shift activity related to the concrete pours to construct the grain silos at the G3 Terminal Vancouver site that will take place over a 30-hour period. Night shift work is required as the concrete must be poured continually to ensure structural design integrity of the silos. Issued: August 1, 2017 – Construction Notice of Pile Installation beginning on August 16, 2017. G3 Terminal Vancouver’s construction team will begin pile installation on August 16, 2017 during the regular work hours of 7 a.m. to 8 p.m. We anticipate that this work will continue through to February 2018. Where construction practices allow, the vibratory piling installation method will be used, which produces less noise than the full use of impact installation methods. For non-temporary piles, the impact piling installation method is necessary for the final stages of pile installation to develop the required bearing capacities. Piles are needed to support foundations of some of the buildings, marine dock, and ship loading equipment, that will facilitate the movement of grain products from the incoming trains onto ships for export. To protect the marine environment, we will use biodegradable hydraulic fluid in marine machinery, employ a bubble curtain during impact pile installation to reduce underwater sound levels, and will monitor for any marine mammal activity. As noise is expected with pile installation, we will be actively monitoring noise levels during the aforementioned activities to ensure that the sound they produce remains within predicted levels. Issued: July 24, 2017 – Construction Notice of Intermittent Night Shift Work at G3 Terminal Vancouver starting on August 7, 2017 to April 30, 2018. Starting August 7, 2017, G3 will undertake intermittent night shift work between the hours of 8 p.m. and 7 a.m. for a variety of reasons which include the need to coordinate the work around tide cycles and the requirements of neighbouring tenants, and where preparation or servicing is required for safe construction operations. Construction activity will be limited to operations that are anticipated to have low impacts to the surrounding community such as welding, servicing of construction equipment, testing and inspection of materials, pile splicing, rock placement, sawcutting, barge unloading, working inside the new concrete buildings, and installation of rebar and underground utilities. 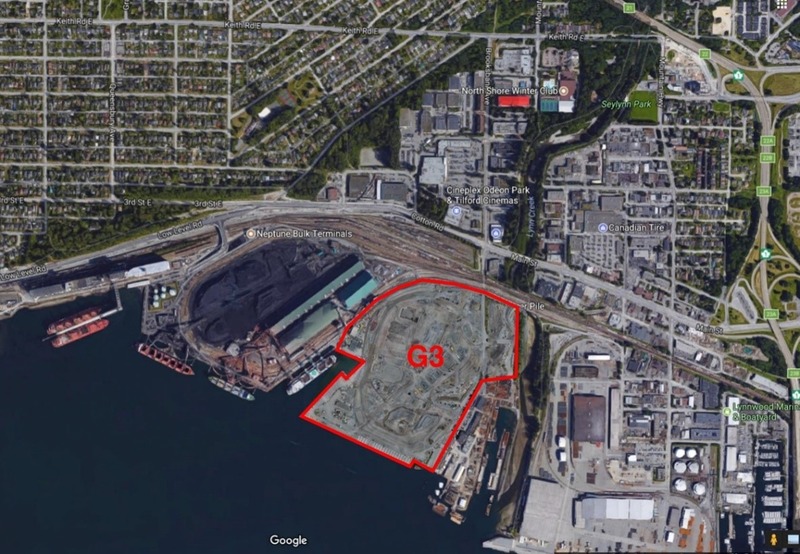 G3 is complying with Vancouver Fraser Port Authority requirements for these extended work hours by implementing mitigation measures and providing further advanced notice when required. Noise levels during this period will be monitored to verify that construction activities do not result in a notable increase to the average existing noise levels. Additionally, lighting mitigation will be in place including lights being placed as close to the ground as possible and directed down and away from residential areas. G3 will provide separate notifications to the community for any specific 24/7 continuous construction work such as concrete silo pours, or if a construction activity is anticipated to have a significant impact outside of the project site. Issued: July 18, 2017 – Construction Notice of Night Shift Work at G3 Terminal Vancouver. Starting August 1, 2017 at approximately 7:00 a.m. through to August 2, 2017 at approximately 1:00 p.m., G3 will conduct an approximately 28-hour-long continuous concrete pour of foundations for several buildings which is necessary to ensure structures are sound and strong. G3 is complying with Vancouver Fraser Port Authority requirements for these extended work hours. Lights will be placed as close to the ground and possible and directed down and away from residential areas. With these mitigations in place there is expected to be little to no impact to the surrounding community. Industrial traffic requiring access to Lynnterm West Gate will be rerouted to a temporary detour starting in June this year. The temporary detour will be on the east side of Lynn Creek accessed via Mountain Highway, Dominion road and Harbour Ave, then along a temporary road built over the rail line and bridge to the G3 and Vancouver Pile Driving sites. We will monitor traffic and adjust to minimize traffic disruptions to local businesses located in the industrial area. There will be a small and temporary realignment of access to the Harbourview Dog Park and while we have made considerable efforts to ensure a safe and timely route be maintained to the parking lot, we suggest that dog owners may wish to access the park via the trail via access points to the north. We apologize for the inconvenience and will be working quickly to install the new roadway safely, and with as little impact as possible. G3’s Summer 2017 community quarterly update can be found by clicking the link. G3’s first community quarterly update can be found by clicking the link. In advance of construction, G3 held a public information session on Thursday, February 9, 2017. During the session, G3 provided up-to-date project information including the start and major phases of construction, construction mitigations, and progress on certain operational mitigations. G3 further sought input from community members on their preferred methods of communication, during the construction process. G3’s public information session display boards can be found by clicking the link. Throughout construction, notifications regarding upcoming activities and expected impacts will be posted on this website and sent via email. You may opt in to notifications by emailing info@g3terminalvancouver.ca. For construction related inquiries, please call (778) 373-3150. For more general G3 Terminal Vancouver inquiries, please call: 1-844-263-2398.